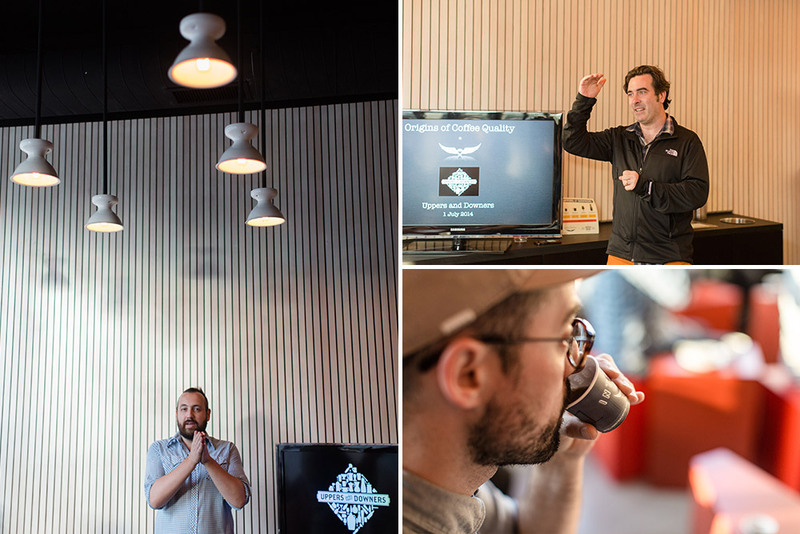 As GBH x Intelligentsia continue to explore the possibilities in coffee beers with the Uppers & Downers series of events, collaborators, homebrewers, and curious drinkers are helping us dive deeper into the complex and creative art. 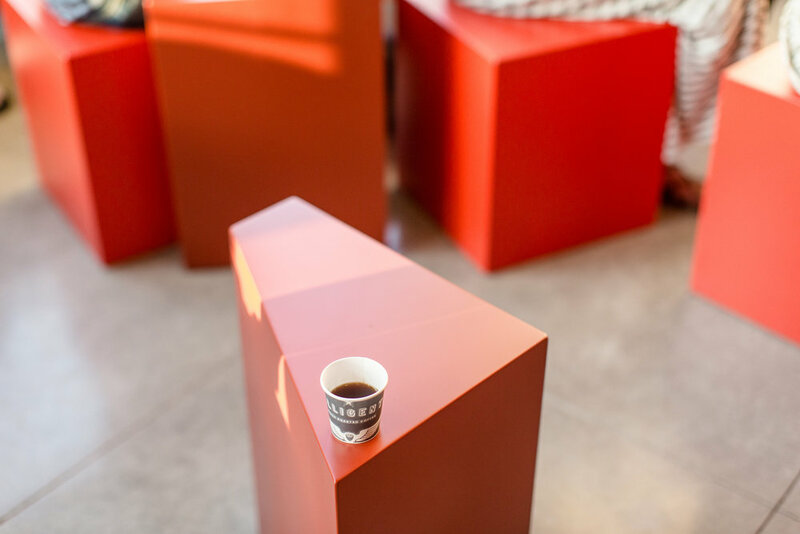 The sold-out Origin event was held at Intelligentsia's the soon-to-open Wicker Park location (July 17th), which was designed in collaboration with the baristas themselves for a beautiful and efficient service experience. Stemming from the original Uppers & Downers concept by Intelli's Stephen Morrissey and GBH's Michael Kiser, the Origin event was created to help people gain a better understanding of the terroir of specialty coffee as it related to beer — comparing flavors and aromas from different regions, elevations, and genetic profiles. Thanks to Ryan Soeder and Collin Moody (the coffee bar manager), and a newly minted Modbar that helps automate the pour over technique for a large gathering, we were able to produce four different coffees for 50 people in about a half hour — a true testament to the efficiency of the service space. Top left: Ryan Burk of Virtue Cider and Stephen Morrissey, Top right, Ryan Knapp, Ryan Burk and Collin Moody. Bottom Left: GBH founder, Michael Kiser. Bottom right: Ryan Soeder. Intelligentsia's Geoff Watts, one of the forefathers' of direct trade, is known as a sort of Indiana Jones of the coffee world, routinely filling up multiple passports every year as he works to keep the lines of communication, knowledge sharing, and coffee buying open between Intelli and farmers around the world. With so much fluctuation on the commodity side of the coffee business in recent years, its these relationships that keep specialty coffee growing — producing some of the most flavorful and technically challenging coffees in the world. Different regions of the world, roughly located on continental zones between the Tropic of Capricorn and the Tropic of Cancer, are known for different flavors. While there's exceptions to every rule, some produce more chocolatey, sweet, "coffee coffee" kinds of flavors, whereas others are more acidic — full of citrus, berry, and tannic notes. Elevation is the third axis in all of these generalities, as the higher the elevation, the better preserved those delicate acidic notes, giving coffee from any region quite a bit of range. Tasting these hand-picked coffees side-by-side for the first time, Origin attendees were able to compare the Geuze-like notes of some Kenyan coffees alongside an Ethiopian variety for genetic comparison, and then two varieties with the sweeter, comforting flavors of Guatemala for a comparison of two genetically similar, but still quite different beans. For those that also attended the Roast event, exploring light-to-dark methods, the ideas were really popping in terms of homebrewing concepts. Many left the educational portion of the event having understood the specialty coffee value chain for the first time. In order to fully express the range of flavors that coffee has to offer, we explored the idea of "origin" on the brewing side as well — through traditional beer and cider styles. First up was MadCap Coffee out of Grand Rapids, MI and Virtue Cider from Fennville, MI, who were challenged to creatively attack the "Culture Clash" category featured in the upcoming homebrew competition. Culture Clash is intended to combine unorthodox and near-impossible combinations of Uppers & Downers into a single, beautiful beverage. Other categories include Roasty Toasty (those lovely coffee porters and stouts) and Light Bright (for lighter pales ales, blonde ales and the likes). Ryan Knapp of MadCap made a cascara tea using the husk, or the "cherry" fruit that surrounds coffee beans on the tree. Typically composted for fertilizer on the farm after the coffee washing process, cascara has also long been used for drinking in native coffee-growing areas. The husk provides a slightly tannic, almost cherry-like flavor, and slightly sweet with a red color. Knapp and Ryan Burk, the cidermaker at Virtue, blended the cascara with Ledbury, a naturally fermented English-style cider with a balanced dryness and sweetness. Steeped together for 45 minutes and strained, the cider becomes more tart and turns a beautiful rose-copper color in the glass, with a bit of cloudiness swirling in the center. The funkiness of the husk and natural fermentation of the cider mingle beautifully, creating a luscious mouthfeel and a faint lambic-like finish. The two are excited by the breakthrough, and fully intend to pursue a commercial release — and certainly plan to make the cider available at the Uppers & Downers main event this fall (details soon). Gaslight Coffee Roasters and 5 Rabbit shared their recent collaboration as well, featuring Yodo con Leche, an imperial coffee porter with made with two kinds of caramel malts, oats for creaminess, and three different dark malts, including rye and a special grain from Patagonia Malting in Chile. They added dulce de leche, a rich caramel from Argentina, and finally a Costa Rican coffee from Gaslight that the two worked on together over the Spring. They had a narrow window in which to source their desired coffee from Finca Agrícola Cafetal, from the Lourdes de Cirrí de Naranjo region of Costa Rica. 5 Rabbit founder Andres Araya flew to Costa Rica to get the coffee himself, returning with a suitcase full. Tristan Coulter and Miro Lomeli roasted the beans just in time for a room-temperature steeping in the beer post-fermentation. We had a little fun with Yodo to finish off the night, topping off a scoop of Jeni's Ice Cream with a straw and taking a dessert-like beer all the way to dessert itself. From Uppers to Downers, the night felt complete with a large serving of education, sensory, and boozy fun. As the evening wound down, and people drifted out of the coffee bar all starry-eyed, I was excited to hear people's fresh ideas for homebrews for the final competition — ideas that without the coffee education and experience of Uppers & Downers may never have come to fruition.